I am unashamedly a massive fan of prosumer electronic and old skool EBM legends Portion Control. Much could, and should be said about their influence on all those now major artists that the kids have taken to heart and without this duo a hell of a lot would be missing from today’s Industrial scene. ‘Roast’ opens up this new opus in obscure form preparing you for the snide vocals and EBM proper, as it should always be played; raw and driving, skin crawling and hook sinking with subtlety, dripping and oozing conviction from the off. ‘Global’ is a sneering audio bully that chugs along with a grinding bass line leaving way for Dean to casually inform us that he has no sympathy for us anymore, with that ever evident knack of worrying the listener into believing, that if you don’t listen you are heading for a good pasting; an evident darker side to two of the nicest lads a person could ever wish to meet. Portion Control are not firmly stuck in the past as you may imagine; they’re quite simply one of the most relevant acts on the planet full stop. Clever manipulations of sound and ambience are let into the mix occasionally to break up the journey and there is a sense of new found modernity and surges of desperate urgency flowing within the veins of this release in constant evolving waves of a well oiled machine and is smoothly composed from start to finish. 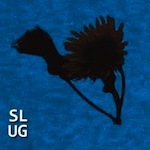 Slug is fun, it’s energetic, its engaging and slaps you across the face just when you think you have been given a reprieve; it’s not a bludgeoning album, rather it’s a taunting and threatening release that slowly grinds you down until you simply have to submit. The originators and master’s are back, this is simply excellent. This entry was posted in Portion Control.Net. Bookmark the permalink.